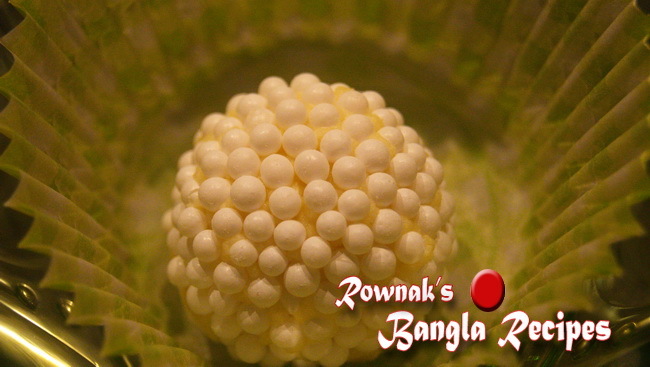 RosKodom is cheese stuffed chamcham and rolled in sugar bead. Nowadays stuffing chamcham becomes optional, so if you want to omit stuffing chamcham, just feel free to do that. I try to make this recipe as easy as possible. For sugar bead if you live it overseas, you can buy check in cake decoration shop(look for 4mm matt white sugar beads). Thanks for staying with me in my Bangladeshi Dessert’s venture. 1. Mix milk powder, cheese, ghee and sugar in a pan and mix it well. 2. Cook it on medium heat stirring continuously until it starts leaving the sides of the frying pan and becomes like dough. Cook 2 minutes more. 3. Let it pour into a bowl and let it cool down till it becomes just lukewarm. 4. Divide it into 8 balls and stuff each chamcham in each milk balls. 5. Roll them in sugar bead and enjoy Roskodom. You can few drops rose water if you want. Cheese needs to be smooth. For smooth cheese you can knead cheese. Many thanks for the recipe. Haven’t tasted it for the last 20 years. Very easy recipe and you dont even need luck for it. Best of luck. Did u buy those sugar beads from Coles/Woolies? I bought those matt bead from cake decoration shop.In my city Coles/ Woolies has pearl white bead. but you can check. you can use Pearl white bead too. Thanks. hi …Milk powder quantity .1tblsp or 1 cup ?